What’s the best way to learn about complex social issues like poverty and family homelessness? Guest blogger Lisa Gustaveson, Seattle University's Faith & Family Homelessness Program Manager, has been working with faith communities in King, Pierce and Snohomish counties to answer this question. Among their strategies is a simulation exercise. Read on to learn how Poverty Immersion Workshops can help people more deeply understand and take action to stop the cycle of generational poverty and homelessness. High school student Winta and her family came to the United States from Ethiopia about eight years ago. While they had a relatively easy transition, some of their friends who are also immigrants have struggled to make ends meet and experienced homelessness. Winta shares her friend Martin's story as well as her own in this guest post. At age 14, Brandy Sincyr, along with her mother and sister, escaped an abusive stepfather and found herself bouncing between shelters and temporary living arrangements. Despite the many challenges of not knowing where she would sleep each night, Brandy graduated from high school -- and then went on to earn a political science degree from Seattle Pacific University in June. Now she's leveraging her own experience to advocate on behalf of the more than 27,000 homeless students in Washington state. Read Brandy's story in the final post of our "Back to School" series on student homelessness. 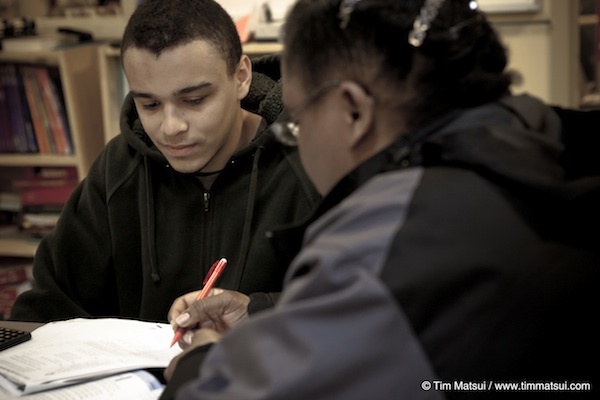 A YouthCare client works toward his GED. High school completion and GED programs designed for homeless youth must focus on individual students' needs and goals. Photo courtesy YouthCare. 27,390. We've been sharing that number a lot this week because it's how many students in Washington state have been identified as homeless. What that number doesn't include is the thousands of young people who have left the school system because of homelessness. If they never find their way back to school, they are likely to become trapped in the cycle of poverty and homelessness. Melinda Giovengo, YouthCare's executive director, writes today's guest post about how flexible high school completion and GED programs can help homeless young people find a path to post-secondary education and successful careers.